^ Sterken, Joeri; Troubleyn, Joris; Gasthuys, Frank; Maes, Viviane; Diltoer, Mark; Verborgh, Christian (1 October 2004). “Intentional overdose of Large Animal Immobilon”. European Journal of Emergency Medicine. 11 (5): 298–301. doi:10.1097/00063110-200410000-00013. ISSN 0969-9546. PMID 15359207. ^ Tetrault, Jeanette M.; Butner, Jenna L. (3 September 2015). 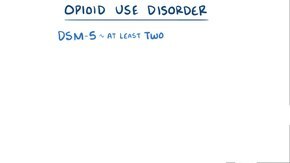 “Non-Medical Prescription Opioid Use and Prescription Opioid Use Disorder: A Review”. The Yale Journal of Biology and Medicine. 88 (3): 227–233. ISSN 0044-0086. PMC 4553642. PMID 26339205. ^ Tarabar, Asim F.; Nelson, Lewis S. (1 April 2003). “The resurgence and abuse of heroin by children in the United States”. Current Opinion in Pediatrics. 15 (2): 210–215. doi:10.1097/00008480-200304000-00013. ISSN 1040-8703. PMID 12640281. ^ Gray, Eliza (4 February 2014). 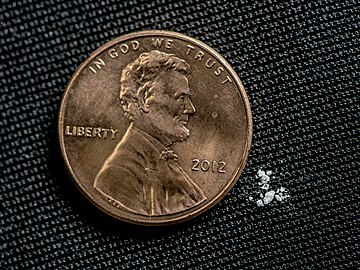 “Heroin Gains Popularity as Cheap Doses Flood the U.S”. TIME.com. Retrieved 12 February 2016. ^ Maltoni, M. (1 January 2008). 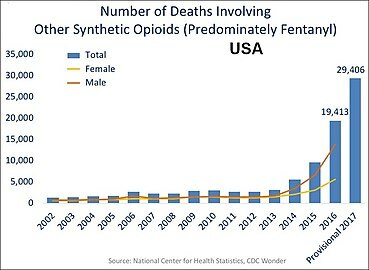 “Opioids, pain, and fear”. Annals of Oncology. 19 (1): 5–7. doi:10.1093/annonc/mdm555. ISSN 0923-7534. PMID 18073220. [A] number of studies, however, have also reported inadequate pain control in 40%–70% of patients, resulting in the emergence of a new type of epidemiology, that of ‘failed pain control’, caused by a series of obstacles preventing adequate cancer pain management…. The cancer patient runs the risk of becoming an innocent victim of a war waged against opioid abuse and addiction if the norms regarding the two kinds of use (therapeutic or nontherapeutic) are not clearly distinct. Furthermore, health professionals may be worried about regulatory scrutiny and may opt not to use opioid therapy for this reason. ^ McCarberg, Bill H. (1 March 2011). “Pain management in primary care: strategies to mitigate opioid misuse, abuse, and diversion”. Postgraduate Medicine. 123 (2): 119–130. doi:10.3810/pgm.2011.03.2270. ISSN 1941-9260. PMID 21474900. ^ ARNP, Pamela Davies MS; CNS, Yvonne D’Arcy MS, CRNP (26 September 2012). Compact Clinical Guide to Cancer Pain Management: An Evidence-Based Approach for Nurses. Springer Publishing Company. ISBN 9780826109743. ^ “21 U.S. Code § 802 – Definitions”. LII / Legal Information Institute. Retrieved 12 February 2016. ^ “Definition of NARCOTIC”. www.merriam-webster.com. Retrieved 12 February 2016. ^ Mohamadi, Amin; Chan, Jimmy J.; Lian, Jayson; Wright, Casey L.; Marin, Arden M.; Rodriguez, Edward K.; von Keudell, Arvind; Nazarian, Ara (1 August 2018). “Risk Factors and Pooled Rate of Prolonged Opioid Use Following Trauma or Surgery: A Systematic Review and Meta-(Regression) Analysis”. The Journal of Bone and Joint Surgery. American Volume. 100 (15): 1332–1340. doi:10.2106/JBJS.17.01239. ISSN 1535-1386. PMID 30063596. ^ “PAIN”. Painjournalonline.com. 1 September 2015. Retrieved 7 January 2016. ^ Kissin I (28 September 2015). “Long-term opioid treatment of chronic nonmalignant pain: unproven efficacy and neglected safety?”. J Pain Res. 6: 513–29. doi:10.2147/JPR.S47182. PMC 3712997. PMID 23874119. ^ a b Goldman, RD (December 2010). “Codeine for acute cough in children”. Canadian Family Physician. 56 (12): 1293–4. PMC 3001921. PMID 21156892. ^ Paul, IM (February 2012). “Therapeutic options for acute cough due to upper respiratory infections in children”. Lung. 190 (1): 41–4. doi:10.1007/s00408-011-9319-y. PMID 21892785. ^ Bolser, Donald C. (1 February 2010). “Pharmacologic Management of Cough”. Otolaryngologic Clinics of North America. 43 (1): 147–155. doi:10.1016/j.otc.2009.11.008. ISSN 0030-6665. PMC 2827356. PMID 20172264. ^ Webster, Lynn R. (1 October 2015). “Opioid-Induced Constipation”. Pain Medicine (Malden, Mass.). 16 Suppl 1: S16–21. doi:10.1111/pme.12911. ISSN 1526-4637. PMID 26461071. ^ “Press Announcements – FDA approves Movantik for opioid-induced constipation”. www.fda.gov. Retrieved 18 February 2016. ^ Wiseman, R; Rowett, D; Allcroft, P; Abernethy, A; Currow, DC (March 2013). “Chronic refractory dyspnoea–evidence based management”. Australian Family Physician. 42 (3): 137–40. PMID 23529525. ^ a b c d e Noble, M.; Treadwell, J. R.; Tregear, S. J.; Coates, V. H.; Wiffen, P. J.; Akafomo, C.; Schoelles, K. M. (2010). Noble, Meredith (ed.). “Long-term opioid management for chronic noncancer pain”. Cochrane Database of Systematic Reviews (1): CD006605. doi:10.1002/14651858.CD006605.pub2. PMID 20091598. ^ Santillán R, Maestre JM, Hurlé MA, Flórez J (July 1994). “Enhancement of opiate analgesia by nimodipine in cancer patients chronically treated with morphine: a preliminary report”. Pain. 58 (1): 129–32. doi:10.1016/0304-3959(94)90192-9. PMID 7970835. ^ McCarthy RJ, Kroin JS, Tuman KJ, Penn RD, Ivankovich AD (April 1998). “Antinociceptive potentiation and attenuation of tolerance by intrathecal co-infusion of magnesium sulfate and morphine in rats”. Anesthesia and Analgesia. 86 (4): 830–6. doi:10.1097/00000539-199804000-00028. PMID 9539610. ^ Larson AA, Kovács KJ, Spartz AK (November 2000). “Intrathecal Zn2+ attenuates morphine antinociception and the development of acute tolerance”. European Journal of Pharmacology. 407 (3): 267–72. doi:10.1016/S0014-2999(00)00715-9. PMID 11068022. ^ Malec D, Mandryk M, Fidecka S (March – April 2008). “Interaction of memantine and ketamine in morphine- and pentazocine-induced antinociception in mice” (PDF). Pharmacological Reports. 60 (2): 149–55. PMID 18443375. Retrieved 17 September 2011. ^ Watkins LR, Kinscheck IB, Mayer DJ (April 1984). “Potentiation of opiate analgesia and apparent reversal of morphine tolerance by proglumide”. Science. 224 (4647): 395–6. doi:10.1126/science.6546809. PMID 6546809. ^ Ledeboer A, Hutchinson MR, Watkins LR, Johnson KW (July 2007). “Ibudilast (AV-411). A new class therapeutic candidate for neuropathic pain and opioid withdrawal syndromes”. Expert Opinion on Investigational Drugs. 16 (7): 935–50. doi:10.1517/13543784.16.7.935. PMID 17594181. ^ Schneider JP, Matthews M, Jamison RN (24 October 2010). “Abuse-deterrent and tamper-resistant opioid formulations: what is their role in addressing prescription opioid abuse?”. 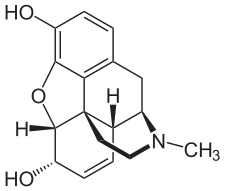 CNS Drugs. 24 (80): 805–810. doi:10.2165/11584260-000000000-00000. PMID 20839893. ^ “UCSF Study Finds Medical Marijuana Could Help Patients Reduce Pain with Opiates”. UC San Francisco. Retrieved 4 March 2016. ^ a b Gharagozlou P, Demirci H, David Clark J, Lameh J (2003). “Activity of opioid ligands in cells expressing cloned mu opioid receptors”. BMC Pharmacol. 3: 1. doi:10.1186/1471-2210-3-1. PMC 140036. PMID 12513698. Gharagozlou P, Demirci H, Clark JD, Lameh J (2002). “Activation profiles of opioid ligands in HEK cells expressing delta opioid receptors”. BMC Neurosci. 3: 19. doi:10.1186/1471-2202-3-19. PMC 137588. PMID 12437765.